November is just around the corner, and that means lots of exciting movies are coming to a theater near you. While you may be spoiled by spending your Saturday nights lounging on the sofa and bingeing your Netflix queue, we’re certain our list of movies will motivate you to get out of the house to see some of these fantastic films at the old-fashioned cinema. 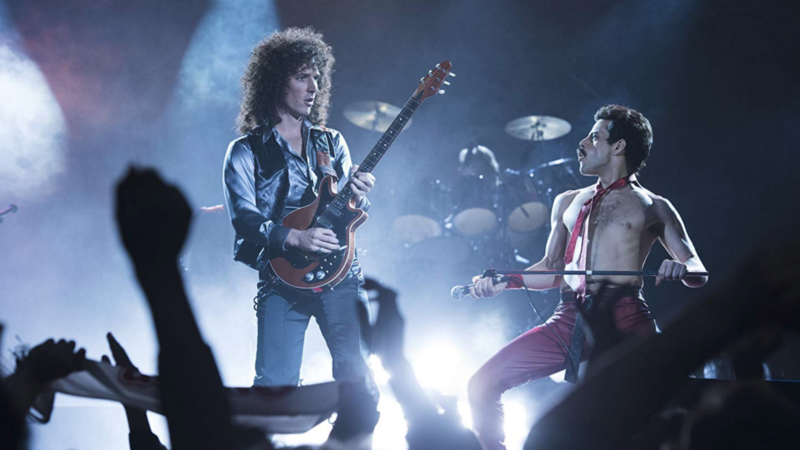 Some November films are award contenders like Bohemian Rhapsody starring Rami Malek, about the '70s glam-rock band Queen. Boy Erased starring Nicole Kidman and Russell Crowe as parents who send their son to gay-conversion therapy will certainly get some Oscar nominations. Other November movies are just about having fun while you watch, like Fantastic Beasts: The Crimes of Grindelwald starring Eddie Redmayne, and a ballet fantasy come to life in The Nutcracker and the Four Realms. Whatever genre excites you, check out our picks for the best films to catch at the theater this November. Rami Malek stars as Freddie Mercury, a gutsy singer who rises to fame as the frontman of Queen in the 1970s and '80s. We’re excited for this movie because we love Malek on Mr. Robot and are curious to see him as a leading man — especially one as dynamic as Mercury. We also think this movie is going to be great because of Queen's legendary operatic rock songs. Hands down, this is going to be one of the best movie musicals of 2018, and you can finally see it starting Nov. 2. Based on a true story, Boy Erased features Lucas Hedges playing a college student whose ultra-religious family can’t accept that he is gay. To “fix” him, his parents (played by Russell Crowe and Nicole Kidman) send him to gay-conversion therapy with serious consequences. The thing about this movie we're most looking forward to are the powerful, emotional performances, particularly from Kidman, whose heart breaks for her distressed son. See the drama unfold on Nov. 2. In theaters Nov. 2, this film takes the Nutcracker story we all know and love and opens it up to an even more magical, colorful and mysterious world where miracles come true. We’re thrilled to see Keira Knightley totally transformed as the Sugar Plum Fairy in a pink wig and character voice. It’s exciting to see an actor we love so much take risks and be part of a fantastical world. We’re also curious to see Mackenzie Foy (Twilight) as ingenue Clara in her first starring role as an adult. Arriving Nov. 9, this classic Christmas story gets an animated reboot for a new generation with an all-star cast. What could be more exciting than Benedict Cumberbatch as the green sourpuss trying to spoil the holidays? Pharrell Williams narrates the story, and with music from Danny Elfman, this may be one of the most fun family movies of the season. Claire Foy plays Lisbeth Salander, the literary world's most icy heroine in the first film adaptation of Stieg Larsson's book The Girl in the Spider's Web (in theaters Nov. 9). This mystery-thriller cuts to the core, especially when the fate of abusive men, justice for women and nuclear codes are at stake. We can't wait to see how Foy interprets the role. In theaters Nov. 9, The New Romantic follows a frustrated college senior and column writer (played by Jessica Barden), who opts out of searching for romantic love when she begins dating a wealthy older man to experience life as a sugar baby. We think this movie looks super-fresh because it's a comedic look at a taboo relationship. Newt Scamander (Eddie Redmayne) again takes us into his exciting wizarding world where all may not be as it seems. This time, he must conspire with Albus Dumbledore (Jude Law) to prevent evil wizard Gellert Grindelwald (Johnny Depp) from allowing pure-blood wizards to overpower the wizarding world and Muggle world alike, threatening all that Newt holds dear. Find out how the Fantastic Beasts saga continues on Nov. 16. Arriving Nov. 16 and cowritten by Gone Girl's Gillian Flynn, this taught, blistering modern-day thriller is the story of four women who are left in huge financial debt after their criminal husbands are killed. The women decide to pick up where their husbands left off and take over a dangerous heist. Viola Davis, Elizabeth Debicki, Michelle Rodriguez and Cynthia Erivo star. This movie looks great because it has women stepping into roles that are traditionally played by men. Wreck-It Ralph (John C. Reilly) and bestie Vanellope von Schweetz (Sarah Silverman) decide to escape the video game world to explore something new: the internet. But when they come across the trendy BuzzzTube video site that entrances Vanellope, can their friendship survive? We can't wait to see this movie with our kids when it arrives on Nov. 21 because the franchise does such a good job entertaining children and adults. World-class pianist Dr. Don Shirley is about to embark on a concert tour that will take him into the Deep South. The only problem is that Shirley is black and will no doubt face racism or worse. When he hires driver and bodyguard Tony Lip (Viggo Mortensen), a hard-edged Italian from the Bronx, they must rely on the Green Book to guide them to Black-friendly establishments. Based on a true story, the movie is already getting Oscar buzz and is slated to arrive Nov. 21. This latest version of the centuries-old folktale (arriving Nov. 21) has Robin Hood (Taron Egerton), a former soldier and rebel, partnering with his Moorish commander (Jamie Foxx) to lead a revolt against the unscrupulous English crown. What's not to love about robbing the rich and giving to the poor? It's the 1700s, and Britain is at war with the French. While Queen Anne (Olivia Colman) should be focusing on the war, her mental stability is deteriorating. Luckily, she has Lady Sarah (Rachel Weisz) to run the country for her — but when a new servant (Emma Stone) shows up, a power struggle ensues as jealousy and bad behavior run rampant. This period comedy looks so caustic and hilarious, we're counting the days until its release. Don't miss this quirky period piece when it arrives in theaters on Nov. 23. When a zombie apocalypse threatens a small town on Christmas Eve, Anna (Ella Hunt) leads a charge against the undead, slashing and singing her way to safety. Yes, this is a zombie musical but don't think it's all fun and tap dancing for Anna, who finds herself in a whole lot of real danger as she tries to protect her friends, family and herself. This movie looks like the best zombie mashup flick since Pride, Prejudice and Zombies, and it's out in theaters on Nov. 30.